Medan (second left) exchanges the contract documents with Ling. BINTULU: Bintulu Port Sdn Bhd (BPSB) has achieved another milestone with the inking of a RM14.12-million contract for the design and construction of a unit of 25-tonne bollard-pull ship-handling tug. 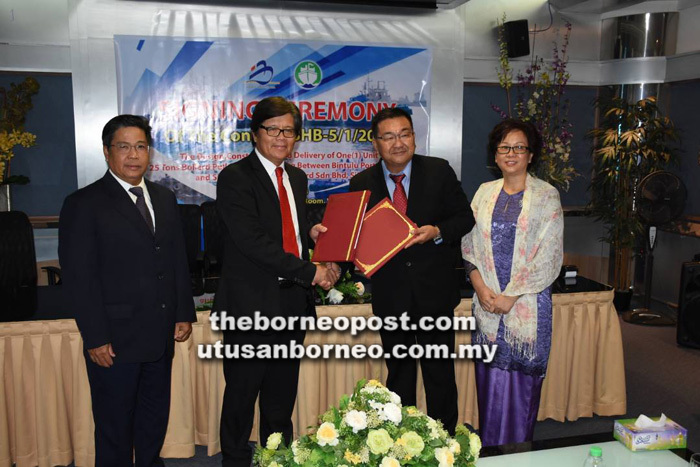 According to the group chief executive officer Datuk Mohammad Medan Abdullah, the partnership signifies BPSB’s mission of providing sufficient number of tugboats for operations and ensuring a seamless service delivery at Bintulu Port and Samalaju Industrial Port. “To achieve our vision to be a world-class port operator in this region, we need to ensure that our operations are equipped with sufficient tugboats of modern designs and high-technology. “Equally important are our people manning the marine operations such as the pilots and tug masters, who have to undergo the requisite training, including computer simulation training, to develop their handling skills and competencies for handling various sizes of LNG (liquefied natural gas) and non-LNG ship operations,” he spoke at the ceremony yesterday. Mohammad Medan represented BPSB, while Sing Kiong Hong Dockyard Sdn Bhd was represented by its managing director Dato’ David Ling Kiong Hua. Medan said BPSB’s marine services play a key role in its operational performance, contributing about 20 per cent of Bintulu Port’s revenue, especially from towage and pilotage operations. He pointed out that the requirement of marine services, such as the marine crafts and pilots, is very critical in ensuring that incoming and outgoing vessels are handled smoothly and safely, according to the international standards and the port’s requirements. According to him, this project is one of the many meant to ensure that marine resources are adequate to support the operations at Samalaju Industrial Port (SIP) which he said had entered Phase 1 operation development in June 1 last year. Its marine services require three units of tugboats, comprising two 45-tonne units and one 25-tonne unit of bollard pull tugboats. The 45-tonne bollard pull tugs have been delivered to the SIP. Adding on, Mohammad Medan congratulated Sing Kiong Hong Dockyard for securing the contract for the construction of one 25-tonne bollard pull ‘Azimuth Stern Drive’ tugboat, adding that the dockyard is entrusted to design and build this tug boat, which must be delivered within 16 months – the period took effect on May 2 this year and expire on Sept 1 next year. This tugboat will be equipped with ‘Yanmar’ main engine and Kawasaki propulsion system. The vessel will be built according to rules and technical standards of the ‘Bureau Veritas Certification’. At the moment, Sing Kiong Dockyard has two ongoing contracts with BPSB – the first is the hiring of two 25-tonne bollard pull tugboats, while the second contract is the hiring of one mooring boat. These contracts will expire on May 18, 2022 and July 31, 2023, respectively. Additionally, Mohammad Medan believed that yesterday’s signing of the contract with Sing Kiong Hong Dockyard would contribute to the growth of the shipbuilding industry within Sarawak. “Although this constitutes a small percentage of the total shipbuilding in Malaysia, the experience gained from this project should bring about far-reaching benefits for Sarawak’s shipyard, especially in spurring the development of local capabilities in building tugboats,” he said. BPSB chief operating officer Omar Salleh, Biport Bulkers Sdn Bhd chief operating officer Yusof Ibrahim and Samalaju Industrial Port Sdn Bhd chief operating officer Matshalleh Mohamad Etli witnessed the signing ceremony at the conference room of Wisma Kontena here.